Bangkok Nights Video Slot Guide & Review - Casino Answers! Bangkok Nights is a 5-reel, 25-line video slot developed by Vegas Technology, featuring wild substitutes, scatter wins, a free spins feature and a bonus game feature. 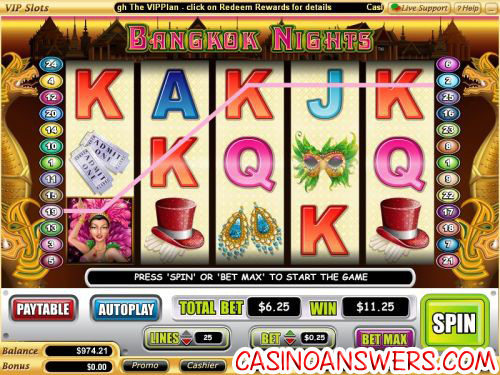 You can play Bangkok Nights at US-friendly online casinos Millionaire Casino and Crazy Slots Casino. If you want to play Bangkok Nights with the default bet of $0.01 per line, you can hit the “Spin” button to start playing immediately. Or, if you wish to change your bet, you can use the arrows next to “Bet” to change the bet to $0.05, $0.25, $0.50, $1, $5 and $10. You can also change the number of lines, though we recommend keeping all 25 active. The minimum bet on Bangkok Nights is $0.01. The maximum bet is $250 per spin. Bangkok Nights is suitable no matter what kind of stakes you wish to play for. If you get 5 Dancing Girl symbols on an active payline in Bangkok Nights, you will win the 10,000 coin top fixed jackpot. The Dancing Girl symbol is also the wild substitute symbol and will substitute for all symbols in Bangkok Nights except for the Scattered Club symbol. Bangkok Nights’ scatter symbol is the Bangkok Nights Club symbol. When 3 or more Scattered Club symbols appear left to right, you will trigger the free spins feature. You will win 12 free spins wil a 3X multiplier. All of your winnings will be tripled. The free spins feature can be re-triggered. Free spins are played at the lines and bet of the triggering spin. Free spin wins will be added to payline and scatter wins. When the Dancing Girl wild symbol appears on both the first and fifth reels and the same time, you will trigger Bangkok Nights’ Pick and Win bonus game. In the game, you must choose one of the two symbols to reveal a prize. You can either accept that prize or try the other symbol. In the Pick and Win feature, you can win up to 100X your bet. All prizes are multiplied by the triggering bet. The Pick and Win feature can be won during the free spin feature. The Bangkok Nights video slot has an autoplay mode for players who don’t want to have to click the “Spin” button too many times. You can set the spin settings for up to 500 autoplay spins and the number of seconds between spins from 0.25 seconds to 2 seconds. The stop settings are to stop once all spins are complete, to stop when the jackpot is won, to stop if a win exceeds or equals (from $50 to $250), to stop on any win and to stop if your credits are increased or decreased (from $50 to $250). You can cancel Bangkok Nights’ autoplay mode at any time by hitting the “Cancel Autoplay” button. With a sizeable 10,000X top fixed jackpot, a free spins feature with a 3X multiplier and a bonus game (even if a little rudimentary), Bangkok Nights is a good choice for any slots player and definitely worth at least a few spins. Get three 100% signup bonuses for a total of $5,000 free to play Bangkok Nights and well over 100 other great games at Millionaire Casino! Where can American players play the Bangkok Nights video slot? Players based in the United States of America can play Bangkok Nights at any Vegas Tech online casino. This includes both Millionaire Casino and Crazy Slots Casino – each of which have excellent signup bonus offers that are worth your time to check out. For more on Millionaire Casino, please read our Millionaire Casino Review. Is there an instant play version of Bangkok Nights available? 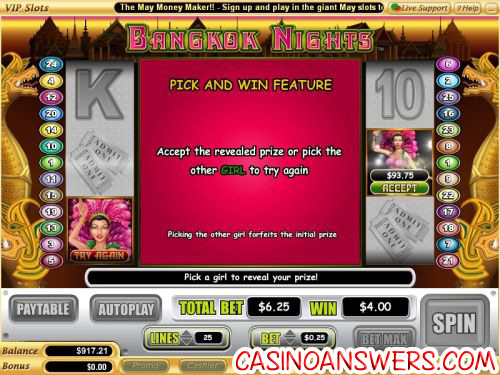 Yes, Millionaire Casino offers an instant play version of Bangkok Nights on their Flash casino. If you encounter any problems with the Bangkok Nights Flash game, make sure you have the latest version of Adobe Flash Player installed on your computer. What special features does the Bangkok Nights slot have? Bangkok Nights offers 12 free spins with triple winnings and a “pick ’em” symbol bonus feature. What casinos have the bangkok nights casino game? What slot machines are available at Crazy Slots?